Over the past decade, University of Chicago professor and INCITE investigator Benoît Roux has made great strides in biochemistry using Argonne Leadership Computing Facility resources. One of his recent discoveries fills in essential information inaccessible to experimentalists, and potentially crucial to new therapeutic drug design. “Molecular machines”, composed of protein components, consume energy in order to perform specific biological functions. The concerted actions of the proteins trigger many of the critical activities that occur in living cells. However, like any machine, the components can break (through various mutations) and then the proteins fail to perform their functions correctly. It is known that malfunctioning proteins can result in a host of diseases, but pinpointing when and how a malfunction occurs is a significant challenge. Usually very few functional states of molecular machines are determined by experimentalists working in wet laboratories. Therefore more structure-function information is needed to develop an understanding of disease processes and to design novel therapeutic agents. The research team of Benoît Roux, a professor in the University of Chicago’s Department of Biochemistry and Molecular Biology and a senior scientist in the U.S. Department of Energy’s (DOE) Argonne National Laboratory Center for Nanoscale Materials, relies on an integrative approach to discover and define the basic mechanisms of biomolecular systems—an approach that relies on theory, modeling, and running large-scale simulations on some of the fastest open-science supercomputers in the world. Computers have already changed the landscape of biology in considerable ways; modeling and simulation tools are routinely used to fill in knowledge gaps from experiments and they are used to help design and define research studies. Petascale supercomputing provides a window into something else entirely: the ability to calculate all the interactions occurring between the atoms and molecules in a biomolecular system, such as a molecular machine, and visualize the motion that emerges. Roux’s team recently concluded a three-year Innovative and Novel Computational Impact on Theory and Experiment (INCITE) project at the Argonne Leadership Computing Facility (ALCF), a DOE Office of Science User Facility, to understand how P-type ATPase ion pumps—an important class of membrane transport proteins—operate. Over the past decade, Roux and his collaborators, Avisek Das, Mikolai Fajer, and Yilin Meng, have been developing new computational approaches to simulate virtual models of biomolecular systems with an unprecedented accuracy. The team exploits state-of-the-art developments in molecular dynamics (MD) and protein modeling. The MD simulation approach, frequently used in computational physics and chemistry, calculates the motions of all the atoms in a given molecular system over time—information that’s impossible to access experimentally. In biology, large-scale MD simulations provide a perspective to understand how a biologically important molecular machine functions. For several years Roux’s research has been focused on membrane proteins, which control the bidirectional flow of material and information in a cell. Now, in a major breakthrough, he and his team have described the complete transport cycle in atomic detail of a large calcium pump called Sarco/endoplasmic reticulum calcium ATPase, or SERCA, which plays an important role in normal muscle contraction. This membrane protein uses the energy from ATP hydrolysis to transport calcium ions against their concentration gradient and, importantly, its malfunction causes cardiac and skeletal muscle diseases. Roux and his team wanted to understand how SERCA functions in a membrane, so he set out to build a complete atomistic picture of the pump in action. Das, a postdoctoral research fellow in Roux’s lab, did that by obtaining all the transition pathways for the entire ion transport cycle using an approach called the string method—essentially capturing a “molecular movie” of the transport process, frame-by-frame, of how different protein components and parts within the proteins communicated with each other. This achievement has yielded an unprecedented level of detail about the pump’s mechanism, which can now be exploited by experimentalists to further probe this important system. A membrane protein, like all protein molecules, consists of a long chain of amino acids. Once fully formed, it folds into a highly specific conformation that enables it to perform its biological function. Membrane proteins change shape and go through many conformational “states” to perform their functions. Experimentalists understand the structural details of proteins’ stable conformational states, but very little about the process by which a protein changes from one conformational state to another. “Only computer simulation can explore the interactions that occur during these structural transitions,” said Roux. Intermediate conformations along these transitions could potentially provide the essential information needed for the discovery of novel therapeutic agent design. (Drugs are essentially molecules that counteract the effect of bad mutations to help recover the normal functions of the protein.) Because membrane proteins regulate many aspects of cell physiology, they can serve as possible diagnostic tools or therapeutic targets. Roux and his team are trying to obtain detailed knowledge about all of the relevant conformational states that occur during the transport cycle of SERCA. In years one and two of his study, Roux’s team identified two of the conformation transition pathways needed to describe SERCA’s transport cycle. Last year, the project shifted focus to the three remaining pathways. As is the case for much of the domain science research being conducted on DOE leadership supercomputer systems today, biomolecular science relies on advances in methodology as well as in software and hardware technologies. The usefulness of Roux’s simulations hinges on the accuracy of the modeling parameters and on the efficiency of the MD algorithm enabling the adequate sampling of motions. Computational science teams can spend years refining their application code to do what they need it to do, which is often to simulate a particular physical phenomenon at the necessary space and time scales. Code advancements can push the simulation capabilities and take advantage of the machine’s features, such as high processor counts or advanced chips, to evolve the system for longer and longer periods of time. Roux and his team used a premier MD simulation code, called NAMD, that combines two advanced algorithms—the swarm-of-trajectory string method and multi-dimensional umbrella sampling. NAMD, which was first developed at the University of Illinois at Urbana-Champaign by Klaus Schulten and Laxmikant Kale, is a program used to carry out classical simulations of biomolecular systems. It is based on the Charm++ parallel programming system and runtime library, which provides infrastructure for implementing highly scalable parallel applications. When combined with a machine specific communication library (such as PAMI, available on the Blue Gene/Q), the string method can achieve extreme scalability on leadership-class supercomputers. ALCF staff provided maintenance and support for NAMD software and helped to coordinate and monitor the jobs running on Mira, ALCF’s 10-petaflops IBM Blue Gene/Q. ALCF computational scientist Wei Jiang has been actively collaborating with Roux’s team since 2012, as part of Mira’s Early Science Program. Jiang worked with IBM’s system software team on early stage porting and optimization of NAMD on the Blue Gene/Q architecture. He is also one of the core developers of NAMD’s multiple copy algorithm, which is the foundation for multiple INCITE projects that use NAMD. The computations Roux and his team ran for this breakthrough work will serve as a roadmap for simulating and visualizing the basic mechanisms of biomolecular systems going forward. By studying experimentally well-characterized systems of increasing size and complexity within a unified theoretical framework, Roux’s approach offers a new route for addressing fundamental biological questions. Roux’s team can be considered to be among the bleeding-edge users of the ALCF, the recipient of a steady succession of INCITE awards on Blue Gene systems since 2008, and whose work on supercomputing resources at Argonne dates back to the laboratory’s Blue Gene/L, which the Mathematics and Computer Science Division installed in 2005 for evaluation. When ALCF’s next-generation system Theta arrives later this year, Roux’s team will again be among the early science users. This research is supported by DOE’s Office of Science. Computing time at the ALCF was allocated through DOE’s Innovative and Novel Computational Impact on Theory and Experiment (INCITE) program. 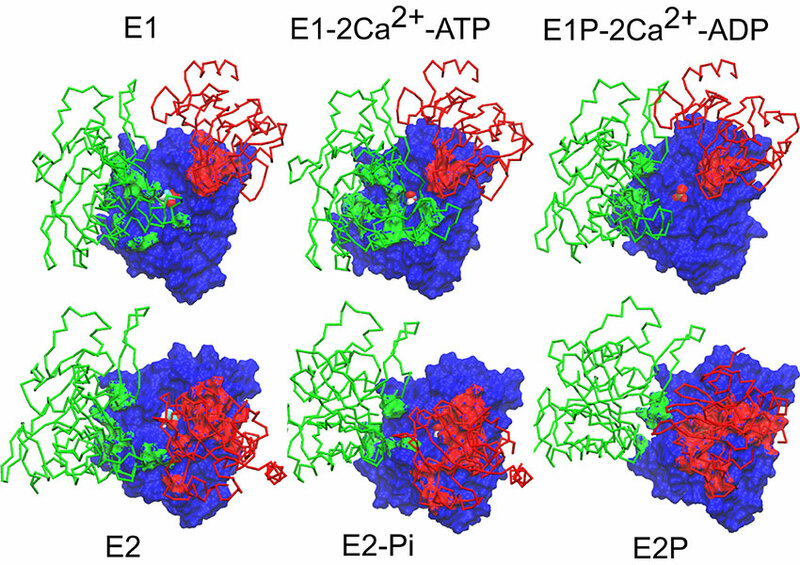 Interaction of cytoplasmic domains in the calcium pump of sarscoplasmic reticulum. These six states have been structurally characterized and represent important intermediates along the reaction cycle. The blue domain, shown in surface representation, is called the phosphorylation domain (P). The red and green domains, shown as Cα traces, are called actuator (A) and nucleotide binding (N) domains respectively. The red and green patches in the P domain are interacting with residues in A and N domains respectively. Two residues are considered to be in contact if at least one pair of non-hydrogen atoms is within 4 Å of each other.